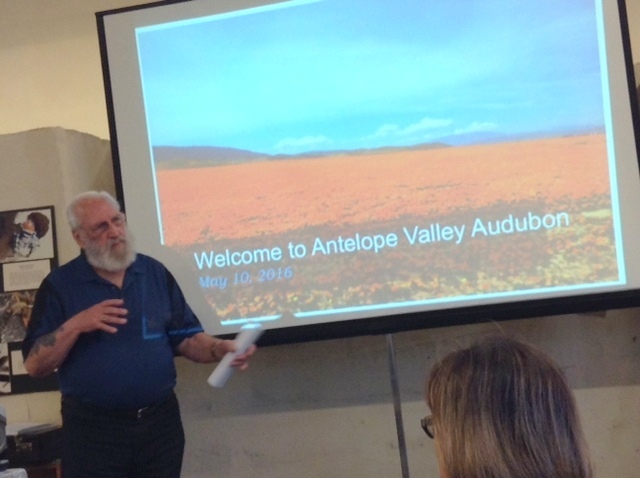 Antelope Valley Audubon Society Holds Its First Meeting of the Modern Era! On Tuesday, March 10 the newest Audubon Chapter in the country had its first official meeting. The Antelope Valley Chapter has spun off from the San Fernando Valley Chapter and all zip codes that begin 931 have been reassigned to the new chapter. If you live in the Antelope Valley, you are strongly urged to check them out! They meet on the second Tuesday of the month at the Prime Desert Woodland Preserve, 43210 35th St West, Lancaster. For more information email [email protected]. They have already started working on some habitat preservation in the area near the Prime Desert Preserve and on ensuring that the breeding flock on Tri-colored Blackbirds at Holiday Lake will thrive. There are many more initiatives awaiting them in the area. They also plan to start a schedule of bird walks and outreach to schools. While they are establishing their own website and social media outlets, you will be able to get information from us. We at San Fernando Valley Audubon Society are thrilled to be working with them as they develop the new chapter in an area that has been rich in birds but poor in Audubon presence.